A favorite knife of hunters and fisherman, the Boker Pen pocket knife in red bone offers a traditional tool in a compact design. Constructed of genuine red bone scales, brass liners, polished nickel silver bolsters and pins with an inlayed medallion. The Solingen German steel blades with a frost etched clip point blade can easily accomplish your cutting needs! 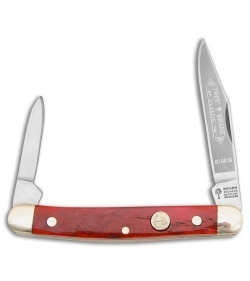 This Pen knife is sure to offer years of enjoyment and reliable use.